The Grand Pacific Hotel was a historic prominent hotel located on the corner of Broadway Avenue & 4th Street, on the site now occupied by the Wells Fargo Building. The hotel also housed other businesses, including a steak house and, for most of its existence, Finney Drug. Throughout its existence, the hotel was either built, re-built, or significantly renovated at least four times, partly due to several major fires. The hotel ceased operations in 1973 and was demolished as part of an urban renewal project in 1974. The site was replaced by the present-day Wells Fargo office complex (soon to be called Grand Pacific Center), then called Northwestern Bank (later Norwest). Later in 1974, the Petersons, long-time operators of the Grand Pacific Hotel, opened GP Warehouse and Emporium at 517 E Main Avenue inside the former Bismarck Grocery warehouse. The building, today an office complex called Civic Square, later housed Front Page Tavern. The hotel’s roots dated back to July 1880 when Louis Peterson opened the Pacific Hotel, named in honor of the Northern Pacific Railroad. Following his suicide in 1889, ownership of the hotel eventually passed onto Henry Tatley, who married the widowed Peterson in 1892 (a Tribune article from 1906 says Tatley acquired the hotel in 1897). Peterson’s son, John, later became a clerk at the hotel under Tatley and quickly worked his way up into management. The hotel was relocated across the street into a new framed building in November 1897. Its original home later housed First Guaranty Bank until it was demolished in 1920. A modern brick structure was completed in 1906 at the northeast corner of 4th Street and Broadway Avenue, at a cost of $60,000. The new hotel was marketed as a first-class lodging facility and directed connected to its Pacific Hotel predecessor. The grand “new wing” contained 60 rooms – 2o of which with private baths, along with a billiard room, cafe, bowling alleys, and what was touted as the city’s “finest barber shop” complete with Turkish baths. In conjunction with the original Pacific Hotel, the two properties contained 120 rooms. In 1912, the original Pacific Hotel building was replaced with a 4-story brick annex structure that was molded into the 1906 Grand Pacific Hotel addition. In 1915, a fire badly damaged the hotel, forcing the ten year-old building to undergo extensive renovation. When Tatley retired in 1924, John Peterson and his brother, Frederick, purchased both the Grand Pacific and Bismarck Hotels, restoring official ownership of the hotel to the Peterson family. John passed away in 1940, but Frederick continued its operation until his retirement in 1944, at which time ownership transferred to John’s wife and sons, John Jr. and Vernon. The 1950s were a particularly prosperous time for the Grand Pacific Hotel, when became headquarters of the Williston Basin oil-hunt. The Grand Pacific Hotel was nearly destroyed by another fire on June 5, 1954. Damages were initially estimated at $50,000, however that estimate quickly grew to $150,000. The blaze was started when Francis Stram, a Northwestern Bell employee staying on the fourth floor, had fallen asleep with a lit cigarette. Stram was sentenced to 90 days in jail for starting the fire, however his sentence was suspended shortly after conviction. Only ten rooms were damaged by the first itself, but the hotel suffered extensive smoke and water damage, particularly where the fire had started in the north wing. When a restaurant housed within the hotel reopened four days later, its owners covered the water stains with posters promoting fire prevention, including a large sign that read “Don’t smoke in Bed – The Ashes May Fall on The Floor”. The building immediately underwent a major renovation, completed in May 1955, marking the fourth time the hotel was either built or significantly renovated in its history. The final costs of the renovation were $350,000. Business slowly degraded at the Grand Pacific Hotel throughout the 1960s and 1970s. Increased competition from modern hotels, and a major traffic shift with the completion of Interstate 94, and a declining downtown were contributing factors. The hotel first became the target of urban renewal in the late 1960s. Early on, Dakota National Bank had intentions to open a 5-to-8-story office complex housing its headquarters. Gate City Bank foreclosed on the property in 1971. Interestingly, Gate City allowed operations to continue under the John Peterson, whose family established the hotel in 1880 and resumed ownership in 1924. By mid-1973, most of the retail tenants, including Finney Drug, had relocated. Lodging and convention operations continued until October, when the building was ordered vacated. The hotel’s furnishings and other assets were auctioned off in November, generating $46,915. The building was demolished in 1974 as an urban renewal project. 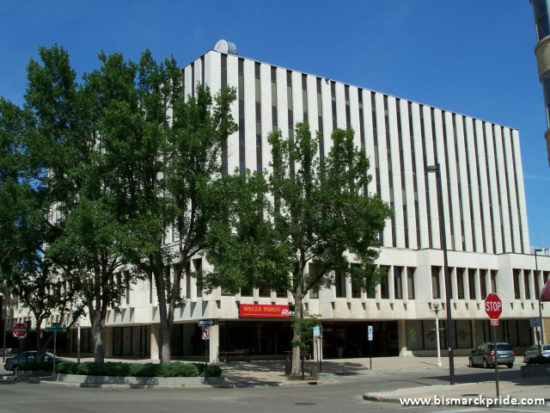 Northwestern Bank (later Norwest, now Wells Fargo) obtained preliminary approval, in February 1974, for constructing a 7-story office building and accompanying parking ramp, which remains today. In 2017, it was announced that the building would be renamed Grand Pacific Center in honor of the site’s legacy. The original Pacific Hotel opened in 1880. The building how it appeared prior to the 1954 fire. Retailer housed within the hotel. Postcard depicting the Grand Pacific Hotel from the 1930s. Lobby of the hotel. Grand Pacific Hotel undergoing demolition.